Seahorses are different from most animals when reproducing. Most notably, the males are the ones who carry the developing embryos and give birth while the females are simply responsible for laying eggs into a pouch on their partner's abdomen. Meanwhile, the gestation period for White's seahorses is only three weeks long, but as many as 250 babies can be released during the delivery. As a rare video of a wild birth shows, the tiny newborns can be seen emerging from the father's abdomen before getting swept away by the current. 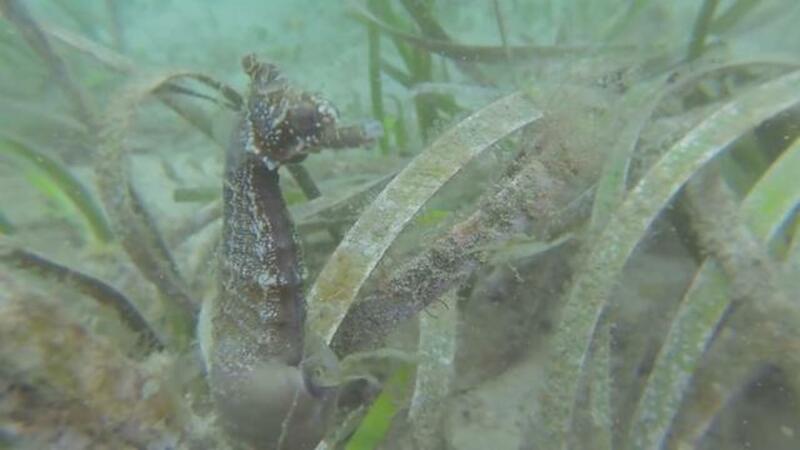 Despite the high numbers of seahorses that are born at one time, conservationists remain concerned about the population which faces risks from fishing activities. A purple crinoid hangs out on a dead coral stalk. Seeing two deep sea animals interacting with each other is rare. What is particularly rare is when they behave the opposite of how we expect them to. As we approached this armored sea robin, a brittle star climbed on top. We were pretty sure that the fish would try to eat the brittle star, but as it turns out, it just wanted to dislodge the extra baggage. The brittle star then proceeded to climb on top of the sea robin two more times. This beautiful hydromedusa was imaged in Washington Canyon. Unfortunately, none of the scientists watching the dive live specialized in water column life. However, due to the pace at which telepresence allows us to disseminate information, the video of this organism was quickly circulated around the country to experts in the field and the hydromedusa was identified as Cyclocanna welshi with a couple days. We imaged this purple octopus with large glassy eyes during dive #8. Crossota sp., a deep red medusa found just off the bottom of the deep sea. Anemone attached to a carbonate boulder near the GC852 sampling station at 1,500 meters depth. A lovely sea cucumber dancing in the water column is imaged by the Little Hercules ROV at approximately 1500 meters depth offshore Kona, Hawaii. Image taken during ROV shakedown operations aboard NOAA Ship Okeanos Explorer on March 22, 2010. Here, an octopus mother protects her eggs in Hendrickson Canyon. If you look closely, you can see the eyes of a baby octopus through the egg. Portrait of a juvenile boxfish, 1 cm long, collected by a bluewater diver in the top 30 meters of the Celebes Sea water column. Image of the breathtaking squid captured on camera during ROV Dive 3. Rock hind in a sponge photographed while free diving off Klien Bonaire in about 20 ft. of water. Image courtesy of Bonaire 2008: Exploring Coral Reef Sustainability with New Technologies, Chris Coccaro, NOAA-OE. This stunning octopod, Benthoctopus sp., seemed quite interested in ALVIN's port manipulator arm. Those inside the sub were surprised by the octopod's inquisitive behavior. This giant isopod is a representative of one of approximately nine species of large isopods (crustaceans related to shrimps and crabs) in the genus Bathynomus. They are thought to be abundant in cold, deep waters of the Atlantic and Pacific Oceans. Bob Carney of LSU caught this specimen in one of his deep-water fish traps. Aulococtena is the size and color of an orange and has two tentacles that are white, thick, unbranched and very sticky. This species has been encountered from 350-1100 meters deep on this expedition.